Become a student of measurement. This section offers articles, books, reports, and video on how others are using data, where the future is pointing, and what issues to think about when taking the plunge into data and measurement. This Los Angeles based case study offers a helpful example of data collected and employed to optimize a population’s well-being. This article explains how a logic model can help community development financial institutions (CDFIs) measure and communicate their non-financial impact. Health Impact Assessments (HIAs) help planners factor health outcomes into housing and neighborhood decisions and avoid unexpected costs. Healthy People 2020, developed by the Office of Disease Prevention and Health Promotion within the U.S. Department of Health and Human Services, provides 10-year national objectives for improving the health of all Americans. For 3 decades, Healthy People has established benchmarks and monitored progress over time in order to: Encourage collaborations across communities and sectors, Empower individuals toward making informed health decisions, Measure the impact of prevention activities. A key objective of Healthy People 2020 is highlighting the importance of addressing the social determinants of health by including “Create social and physical environments that promote good health for all” as one of the four overarching goals for the decade. Click through for their overview and objectives on the social determinants of health. The Healthy People 2020 site includes ‘Data2020’, an interactive tool that allows users to search the data topic area or data source related to the Healthy People 2020 objectives. Data2020 also shows health disparity information for measureable, population-based objectives where data are available such as Access to Health Services, Adolescent Health, and Cancer. A Secretary’s Advisory Committee on National Health Promotion and Disease Prevention Objectives 2030 has been formed and the development of Healthy People 2030 is underway. 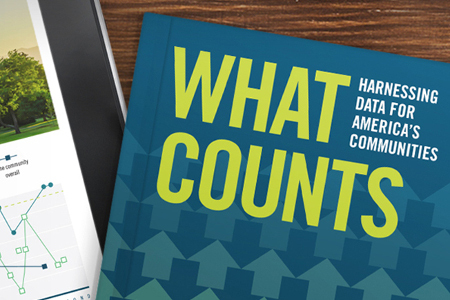 A must read, the Federal Reserve’s What Counts: Harnessing Data for America’s Communities assembles essays from leaders in health and community development on how (and why) they use data. Learn how different organizations plan, use, and benefit from data. Evidence is the backbone of policy change, and data is the backbone of any evidence base. The book, published by the Urban Institute and Federal Reserve Bank of San Francisco, includes perspectives from those in public health, housing, education, finance, and related disciplines on the importance of data in their work. Taken together, they argue that we must be much more strategic in assembling and using data if want to better answer today’s most pressing questions. Better data infrastructure – which includes technologies but also skills, capacities, and leadership – can also help promote cross-sector work. Improving how we collect, use, and, more critically, share data across institutions can reveal the connections across sectors and help us better understand the outcomes of our work. Of course, better use of data in and of itself will not eliminate poverty or produce healthier lives. But it can help us work together in joint action across sectors and get smarter about better targeting resources. The following chapters best illustrate how data can be used to strengthen the intersections between community development and health. An argument and framework for how community development and health can better align what they measure for greater (shared) impact. Published in a special issue of Health Affairs focusing on health and community development, authors Joseph Schuchter and Douglas Jutte provide guidance for community developers and health practitioners to help align their measurement systems to better achieve shared goals. The article highlights promising innovations by organizations such as The Reinvestment Fund and NeighborWorks America. Until building healthier communities pays off for the bottom line, real estate developers won’t likely pay attention to health. This article identifies four key attributes for developing meaningful performance criteria and provide an example in action for the real estate sector. The authors call for the health care and real estate sectors to jointly develop metrics that better evaluate the “performance” of real estate developments from a population health perspective. They specifically identify four important characteristics required for bridging these two sectors. These characteristics include 1) actionable and mutable, 2) community relevant, 3) practical, and, 4) valuable. The history of successful “green” building initiatives are suggested as a potential model, and the Mariposa Project in Denver is provided as a case study. A “metrics 101” tutorial defining when and why to use metrics to prove a case for health outcomes. “Metrics are measures with meaning” starts this tutorial on how projects can move from counting outputs to measuring progress in population health. This chapter from the Practical Playbook series from the CDC, Duke University, and the DuBeaumont Foundation includes tips for sources of metrics, characteristics of good metrics, and how to construct a measurement framework that provides context on what data means. The chapter also includes examples and guidelines for choosing the right metrics. This article from the Centers for Disease Control and Prevention (CDC) proposes a specific set of “bottom-line” health outcomes to measure in population-wide health projects applicable to community-level interventions and investments. Author R. Gibson Parrish describes the “causal web” of person- and community-level factors that influence health and well-being. Self-reported levels of health, functional status, and psychological state. Boxes 1 and 2 in the article include detailed lists of options for each metric. Though focused on medical outcomes, this article provides insight into what outcomes are considered meaningful to the health care and public health sectors. This comprehensive report from the Urban Land Institute (ULI) shows developers and builders how and why they should care about health in neighborhoods of all income levels. The ULI Building Healthy Places Initiative report offers insights from experts and examples from across the United States where health is being built into communities. An accompanying toolkit gives planners and developers a straightforward way to incorporate healthier design into development projects. The toolkit streamlines the vast scientific research on this topic by offering 21 evidence-based recommendations for creating a healthy community. The toolkit also includes a list of certification programs, success stories, and resources. In this blog post and accompanying short video, Dr. Matthew Trowbridge, a pediatrician and senior research fellow at the US Green Building Council, discusses the importance of developing health metrics for the real estate industry to encourage investment in healthy communities. Bringing these two fields—real estate and health—together with shared performance criteria is a must. In an article in Health Affairs, Trowbridge and his coauthors lay out specific criteria for health metrics that the real estate industry and the public health sector can share. A framework for measuring how an organization’s efforts are changing factors essential to strong, vibrant—and healthy—neighborhoods. Though not specifically addressing health, the report by NeighborWorks America shows how communities used their Success Measures tools to help document efforts following the housing crisis to address community stabilization, an important social determinant of health. Health impact assessments help planners factor health outcomes into housing and neighborhood decisions, and avoid unexpected costs. In the journal Shelterforce, Dr. Aaron Wernham takes a closer look at emerging ways to factor health outcomes into decisions that affect housing and neighborhoods. Community development can be integral in addressing population health problems and the high cost of treatment. But to do so, decision makers need a tool for predicting the health outcomes of development. Enter health impact assessments (HIA). By systematically assessing the health risks of development decisions upfront, health impact assessments can prevent costly and harmful mistakes. An HIA in California, for example, identified how development around a light rail stop could boost exercise and connect people to grocery stores, employment, and health services. But it also flagged the potential downside of gentrification and displacement. That led to a list of tailored planning changes. How can a logic model help community development financial institutions (CDFIs) measure and communicate their non-financial impact? This article explains. Written by Ela Rausch of the Federal Reserve Bank of Minneapolis, “CDFIs as Catalysts for Improving Social Outcomes” offers clear examples of how logic models can help CDFIs zero in on their unique contribution to positive change in a neighborhood or community. After reading this article, take a look at the Metrics for Healthy Communities toolkit, also developed by the Federal Reserve Bank of Minneapolis, to start planning and documenting your own impact. The Rausch article was published in Community Investments, a quarterly publication from the Federal Reserve Bank of San Francisco that focuses on community development issues and innovative solutions. The Spring 2012 issue focused on data and measurement. What does effective measurement look like in practice? This case study, featuring the Magnolia Community Initiative in Los Angeles, offers a helpful example of data collected and employed to optimize a population’s well-being. Can measuring impact itself be a tool for strengthening community leadership and partnerships? In short, yes, but it takes smart planning. This detailed “how-to” article by Moira Inkelas and Patricia Bowie shows how that happened in Los Angeles. They designed a measurement system that encouraged network partners to think and act as a team, share accountability, set specific expectations for change, and more. The article originally appeared in the Federal Reserve Bank of San Francisco’s Community Investments journal in an issue focused on collective action for community development.